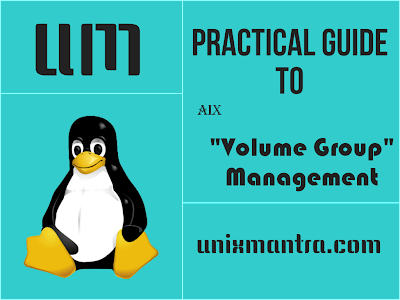 Home » AIX , AIX - Tips , LVM » Practical Guide to AIX "Volume Group Management"
Practical Guide to AIX "Volume Group Management"
Folks I am going to discuss about practical examples and real time usefull commands about AIX Volume Group Management. Use below options to creat Big & Scalable volume groups. -S Creates a Scalable-type volume group. We can do mirroring in AIX, using mirrorvg command and we can create max of three copy of mirror. NOTE: in mirrored VG quorum should be off line because quorum is not recommended for mirror. PV hdisk1 is removed from rootvg mirror. rearranges physical partitions within the vg to conform with the placement policy (outer edge...) for the lv. The above commands shows only online(active) VG’s because testvg is offline so we have to activate testvg using "varyonvg". This makes us enable to mount the filesystems which were created on top of the testvg. Now above command is display the testvg. The above command displays only two online VG’s and it will not show testvg because testvg is offline VG. Using exportvg command we can export VG (including all the PV’s) from one server to another server. Before exporting the datavg, we should Varryoff the datavg, i.e. datavg is moved to offline. Now datavg is exported from the ServerA, after this run the following command to verify the export. It won’t show datavg name. Because datavg is exported. After that we can remove the PV’s from ServerA for import datavg to ServerB. #lspv (it will display the installed PV’s) if hdisk3, hdisk4 is available then PV’s are configured properly. Like this we can import. After importing the datavg, we no need to Varryon datavg, automatically it will Varryon while importing. Run the lsvg command on the volume group and look at the value for MAX PVs. The value is 32 for normal, 128 for big, and 1024 for scalable volume group. If a physical volume is part of a volume group, it contains 2 additional reserved areas. One area contains both the VGSA and the VGDA, and this area is started from the first 128 reserved sectors (blocks) on the disk. The other area is at the end of the disk, and is reserved as a relocation pool for bad blocks. If you reached the MAX PV limit of a Normal VG and playing with the factor (chvg -t) is not possible anymore you can convert it to Big VG. 2 partitions and run chvg again. descriptor area expansion. Please wait. can include up to 128 physical volumes with 1016 physical partitions each. If you reached the MAX PV limit of a Normal or a Big VG and playing with the factor (chvg -t) is not possible anymore you can convert that VG to Scalable VG. A Scalable VG allows a maximum of 1024 PVs and 4096 LVs and a very big advantage that the maximum number of PPs applies to the entire VG and is no longer defined on a per disk basis. !! !Converting to Scalable VG is an offline activity (varyoffvg), and there must be free PPs on each physical volume, because VGDA will be expanded on all disks. 18 partitions and run chvg again. cannot be imported into AIX 5.2 or lower versions. Continue (y/n) ? 0516-1712 chvg: Volume group bbvg changed. bbvg can include up to 1024 physical volumes with 2097152 total physical partitions in the volume group. Practical Guide To AIX "Paging Space Management"
Practical Guide to AIX "Device Management"